Pope Francis will spend two days in Philadelphia next month, but visitors hoping to catch a glimpse of the pontiff will have to make every minute of their planning count. His two big public events will both be on the Benjamin Franklin Parkway, home to the city's museum district. He'll attend the closing ceremonies of a Vatican-sponsored international gathering of families Saturday night, and celebrate Mass late Sunday afternoon. The pope arrives in Philadelphia at 9:30 a.m., Saturday, Sept. 26 and leaves at 8 p.m., Sunday, Sept. 27. To a certain point, but security perimeters, highway closures and vehicle bans will make it impossible to get close to the papal events. Organizers recommend taking mass transit or a charter bus — and even that could mean miles of walking. WHAT HIGHWAYS WILL BE CLOSED? In Philadelphia, beginning at 10 p.m. Friday: Interstate 76 will be closed eastbound from I-476 to I-95 and westbound from I-95 to U.S. Route 1. I-676 in downtown Philadelphia and 2 miles of U.S. Route 1 near where Francis is expected to stay will also close at that time. In New Jersey, also at 10 p.m. Friday: Admiral Wilson Boulevard and I-676 will be closed to cars entering Camden. The nearly 2-mile-long Benjamin Franklin Bridge between Camden and Philadelphia will also be closed to traffic until around noon Monday but will be open to pedestrians and PATCO rail service. Vehicles can't enter a 3-square mile "traffic box" beginning at 6 p.m. that Friday in downtown Philadelphia and 10 p.m. in neighborhoods west of the Schuylkill River. You can still drive within the zone, but cars won't be let back in once they leave. No vehicles will be allowed within security perimeters around the Benjamin Franklin Parkway and Independence Mall or on designated emergency access roads, including parts of Lombard, Vine and Market streets. The security perimeters go into effect at 10 p.m. Thursday; the emergency access road restrictions start at 8 a.m. Friday. Cars parked on streets in those areas will be towed. OK, SO, HOW DO I GET THERE? Philadelphia regional transit agencies are severely limiting service and selling special papal weekend passes in advance to accommodate expected high ridership. If you haven't gotten your ticket already, it might be too late. From Southeastern Pennsylvania: SEPTA commuter trains are running from just 18 outlying stations. They'll go to one of three city stations. The Airport Line will continue operating between Center City and Philadelphia International Airport. SEPTA received orders for about 330,000 of the $10 papal visit tickets it made available through a lottery for its commuter service, meaning 20,000 could be sold by other means. It's also selling $10 three-day passes for Route 101/102 trolleys and the Norristown High Speed Line through a similar system. Subway service is limited to 11 stations, but special passes are not required. From New Jersey: PATCO trains will operate every 16 minutes from Lindenwold, Woodcrest in Cherry Hill and Ferry Avenue and Broadway in Camden. They'll run to the 9th/10th and Locust stop in Philadelphia, two miles from the spot where the pope will speak and celebrate Mass. The agency is selling 100,000 passes, at $10 for two days. Passengers with PATCO's Freedom card can board for $2.50 per ride. Paper tickets will not be sold. New Jersey Transit is selling 4,140 tickets each day on its Atlantic City line. Those trains will be express from Atlantic City to Philadelphia's 30th Street Station, at $30 roundtrip. Passengers on New Jersey Transit's Trenton-Camden River Line can transfer to PATCO at the Broadway station. About 7,500 River Line passes are being sold each day. Amtrak is adding extra capacity. It's a 30-minute train ride from Trenton and about 95 minutes from Harrisburg. Book quickly. Its Keystone trains from Harrisburg to 30th Street Station have sold out for Saturday. All Amtrak trains from suburban Ardmore, a mere 12 minutes from downtown, have sold out for the entire weekend. SO, MAYBE A BUS INSTEAD? Officials expect 10,000 buses to bring 400,000 people to the papal events. About 1,100 will park in Camden. Other parking sites have not been announced. The Diocese of Harrisburg sold out 1,600 seats on its 30 charter buses within two hours of putting them on sale in April. CAN I TAKE A CAB? Taxis will be permitted to exit and re-enter the traffic zone until 2 a.m. Saturday. After that they'll only be permitted to take people up to the edge of the restricted area. Tight security and traffic restrictions will put considerable distance between drop-off points, some train stations and papal events. 30th Street Station is just eight-tenths of a mile from the Benjamin Franklin Parkway. But bus parking areas along the Camden waterfront are about 2½ miles away, about 1½ miles of which is the Benjamin Franklin Bridge — which has a steep 135-foot climb. WHAT IF I'M ELDERLY OR DISABLED? Special seating is being set aside; officials are also working on possible accommodations for people who have trouble walking. Some ADA-compliant taxis will be available and SEPTA's paratransit service will be available in some areas. OK, I'M THERE. NOW, WHERE CAN I SEE THE POPE? He will speak, meet with families and listen to performances from Andrea Bocelli, Juanes and the Philadelphia Orchestra at the World Meeting of Families' closing ceremonies starting at 7:30 p.m. Saturday. He'll celebrate Mass at 4 p.m. the next day. Both events, in front of the Philadelphia Museum of Art, are free and don't require tickets. Who can attend the pope's speech in front of Independence Hall on Saturday is still being worked out. Organizers say some areas could require tickets and other sections could be open to the general public. In any case, the site cannot accommodate more than 25,000 to 30,000 people. WHAT IF I AM SO FAR AWAY I CAN BARELY SEE THE POPE? From his arrival to his departure, his time in Philadelphia will be broadcast on dozens of large screens set up around the parkway and other key locations. 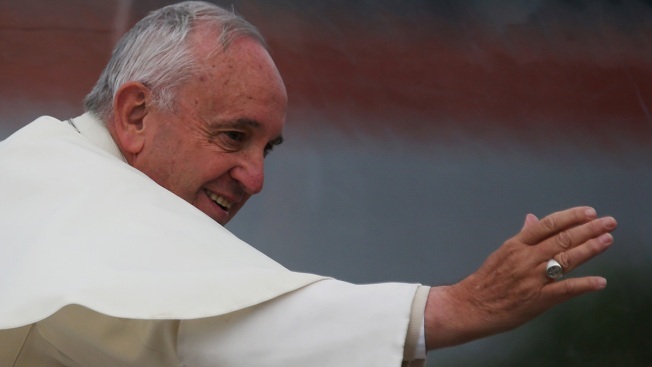 WHAT LANGUAGES WILL THE POPE SPEAK? He is expected to speak primarily in Spanish. The big TV screens will provide English captions. WHAT CAN I BRING INTO THE SECURITY ZONE? Food and beverages are OK. Bags may be subject to size restrictions. The U.S. Secret Service will spell out all the restrictions in early September. WILL FOOD BE SOLD ON SITE? Vendors will be set up all along the parkway. Food trucks will also provide a variety of cuisines and Philly favorites. No alcohol will be sold. WILL RESTAURANTS IN THE AREA REMAIN OPEN? Officials are encouraging downtown restaurants to stay open, suggesting they bring in extra goods before security and travel restrictions go into place. They are also considering allowing limited overnight deliveries — possibly to centralized drop-off areas within the traffic box — on Saturday. More than 3,000 portable toilets will be available on the parkway, including some accessible to the disabled. Maybe. Cellphone carriers are boosting service with mobile cell towers and new antennas. AT&T's Brandy Bell-Truskey suggests texting instead of calling. That takes up far less capacity.